I wanted to head north to Brentwood in search of Honeycrisp apples at Fresh Market (my favorite) so Duke and I grabbed lunch at nearby Local Taco on a Sunday afternoon. I was excited to see they had a brunch menu until 3pm on weekends, because I love eggs in flour tortillas! I often order Mexican egg burritos or huevos chorizo for lunch or dinner at different restaurants, depending on what they offer. Duke had three tacos, the Local BBQ, Grilled Steak, and Portabella. He gave them a 3 for 3 in terms of awesomeness, which is a lot coming from him! The steak was probably his favorite. I chose two brunch tacos, a Southern fried chicken one and a traditional breakfast taco, which featured chorizo, cheese, eggs, and a great curry-flavored red sauce. I also had a side of their potato hash, but it was a little too greasy to be appetizing to me. Still, I devoured those tacos! We also had chips and queso on the side. I definitely think we will be back, because I didn't even get to taste anything on the regular menu. So many unique offerings! The portion size was perfect for me, and we both really felt it was a yummy meal. It's funny how siblings' workplaces can spoil us... first my sister worked at Texas Roadhouse and I was like "Mmmmm, rolls..." and then she worked at Anthropologie and I got a family discount there and at Urban Outfitters. Now I go into UO and I feel like I'm being robbed because they don't take a % off! Spoiled, spoiled, spoiled Aubrey. My boyfriend and cat are both spoiled by my current job... free cat food/treats and CANDY! 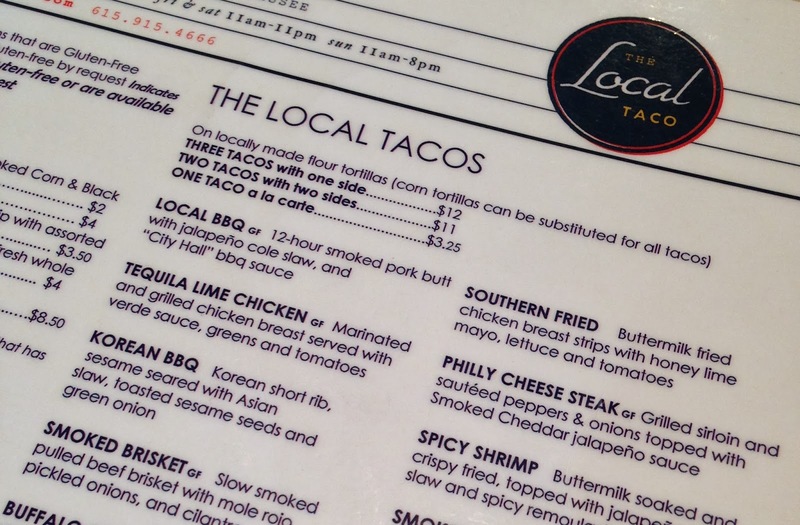 Oh man, I love Local Taco! The Southern Fried Chicken taco was a good choice. Sometimes they have a Thai Coconut taco on their daily special board, and it's my favorite. Keep an eye out for it next time you visit! I love when restaurants have specials... they always tempt me by the fact that I can't get it every day!